Geometric tile patterns can create a unique look and add a designer touch in any room, from kitchens to living spaces and especially in the bathroom – where feature walls, splashbacks and accents can really set off a complete room design. From a simple strip to an entire wall, Geo detailing will upscale any room design, adding a touch of elegance and textured interest. 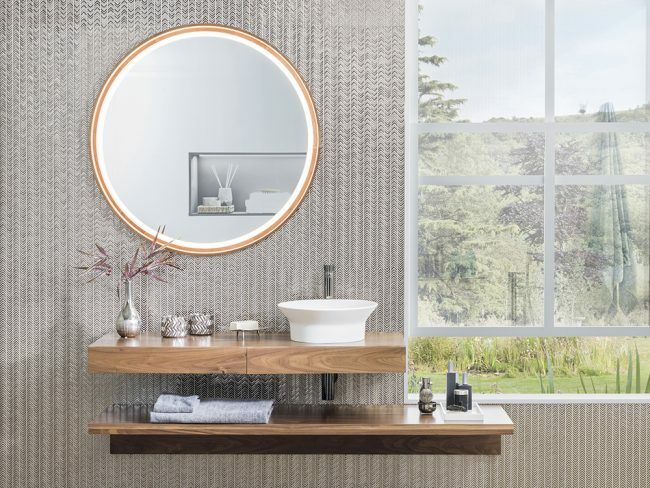 Geometry has found its way into the kitchen, living and dining rooms, kids’ rooms, master bedrooms, baths—and even outdoors around hot tubs and spa features. Geometric tiles perk up a room and form unique patterns that create a back story that sets the tone for the rest of the décor. Today’s geometric tiles typically offer a mix of squares, triangles and rectangular pieces, and ornamenting a wall with geometric tiles will tell a story, just as the Pyramids did. Patterns can be as simple as black-and-white geometric tiles with bright white grout and fresh white walls or a mixture of colours, sizes and shapes to create unique and striking design. 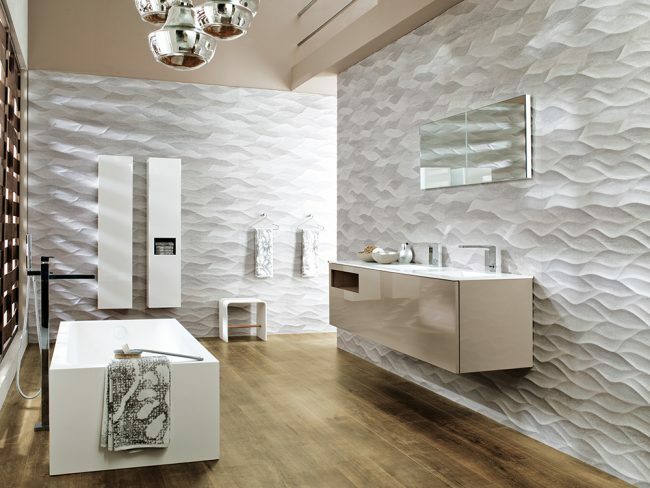 We have a host of Geo styles in our extensive Porcelanosa tile gallery and here is a taster to give you just a few design ideas for your next interior project. Forest Chelsea Nut is a warm geometric tile pattern choice. 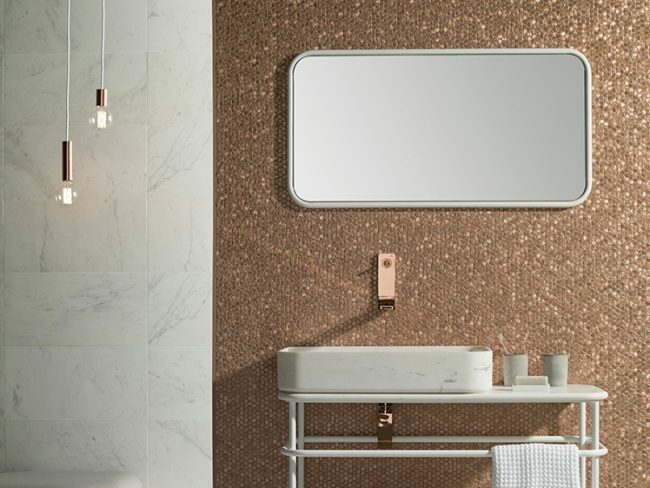 It looks great used as an accent wall in a golden bathroom with warm brown hues adding rhythm and movement to the space. While some designers might want to minimise additional colours or patterns, geometric tiles are meant to be conversation-starters and anything goes. For a simpler geometric tile something like Cubica Blanco offers a stunning wall tile which being light in colour allows you to coordinate furniture and accessories without clashing. 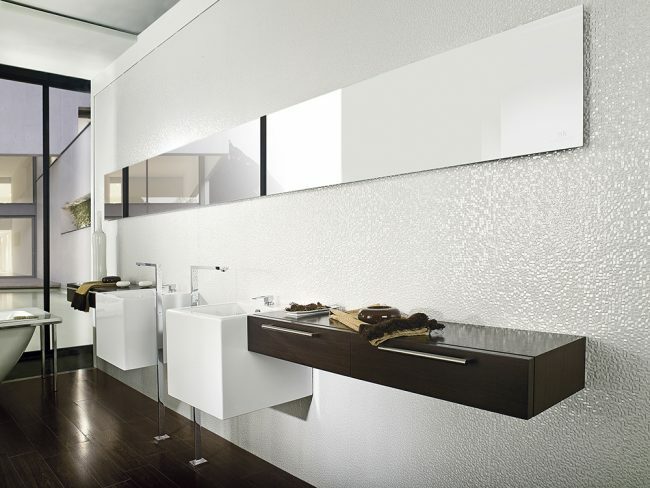 Colors Aluminium Olive or Colors Aluminium Space are ideal choices for a geometric tile backsplash in a bathroom. 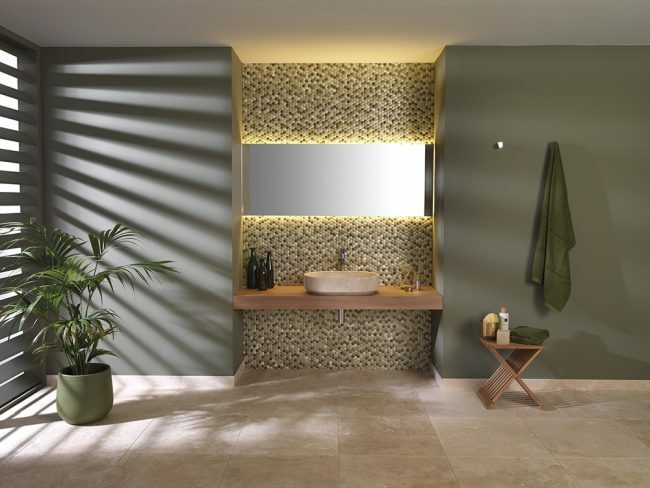 The flash of colour these tiles add is undeniably beautiful and sophisticated. 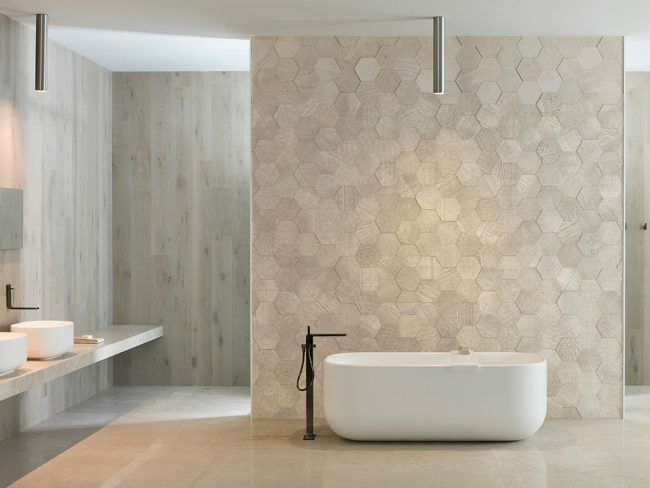 Not all tiles have to be square and Amsterdam 2D Hexagon Beige is a hexagonally-shaped tile that is stunning on a living room wall, against a freestanding bathtub or as a kitchen splashback. The varied patterns within each hexagon create movement while allowing the light to play off the texture. Gravity Aluminium 3D Hexagon Rose Gold is also hexagonally shaped and offers a similar 3D feel to your walls with smaller formed pieces. 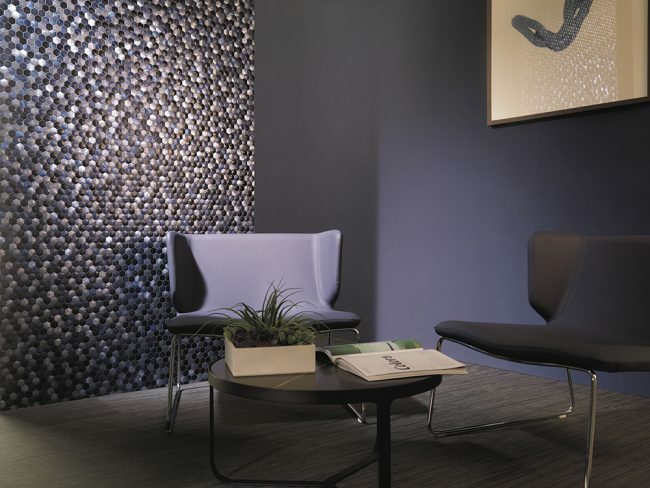 Ona Natural offers a wave-like or mountainous feel with a unique pattern that compels the eye to move across the wall as it adds visual depth to the design and gives the room a natural yet dramatic feel. In contrast Sydney Silver moves the eye up and down with its bold geometric patterns that mimic flowing water. If Geometrics have caught your eye then we have plenty more options to view in our Woking showroom. Let us help you create your perfect space, with touches of modern Geo tile style.